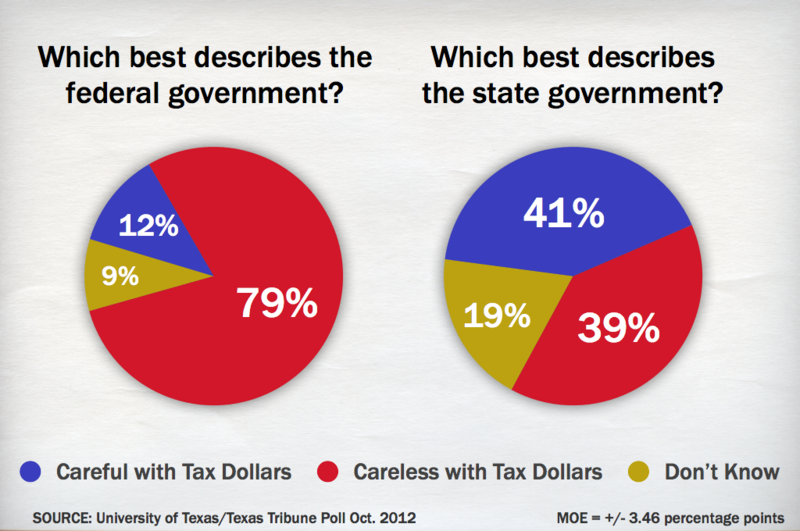 News flash: Texans aren't big fans of the state government in Austin, according to the University of Texas/Texas Tribune Poll. But if you really want to get their dander up, ask about the government in Washington. 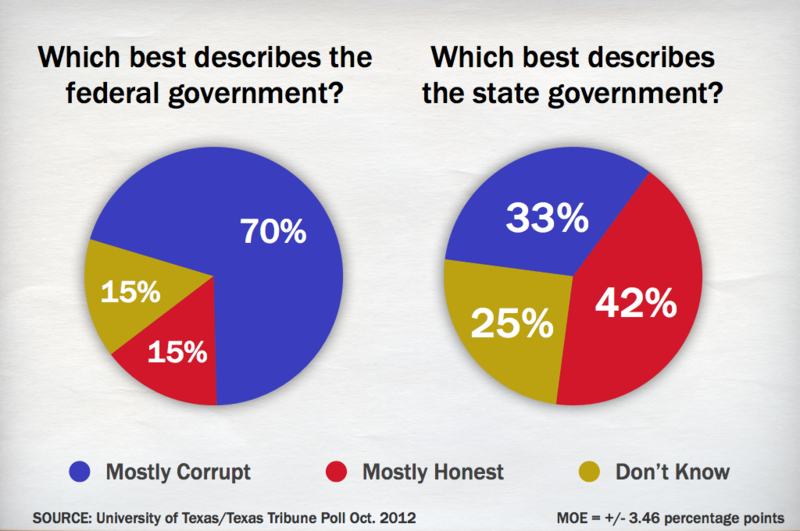 Texans don't trust government very much — especially the federal government, according to the University of Texas/Texas Tribune Poll conducted this month. Their least favorite branch of the federal government? Congress, by a wide margin. Asked to choose their most trusted part of the federal government, only 10 percent listed the legislative branch and Congress. Nearly three times as many listed the executive branch and the presidency, while 34 percent listed the judicial branch and the Supreme Court. “The branch closest to the people is the one we hate the most,” said Daron Shaw, a political science professor at UT-Austin and co-director of the poll. His fellow pollster Jim Henson, the head of the Texas Politics Project at UT-Austin, said the Supreme Court’s decision upholding the federal health care law was disconcerting to Republicans, but said there’s a reason that’s still the most trusted branch. “There’s nowhere else for conservatives in the state to go right now. 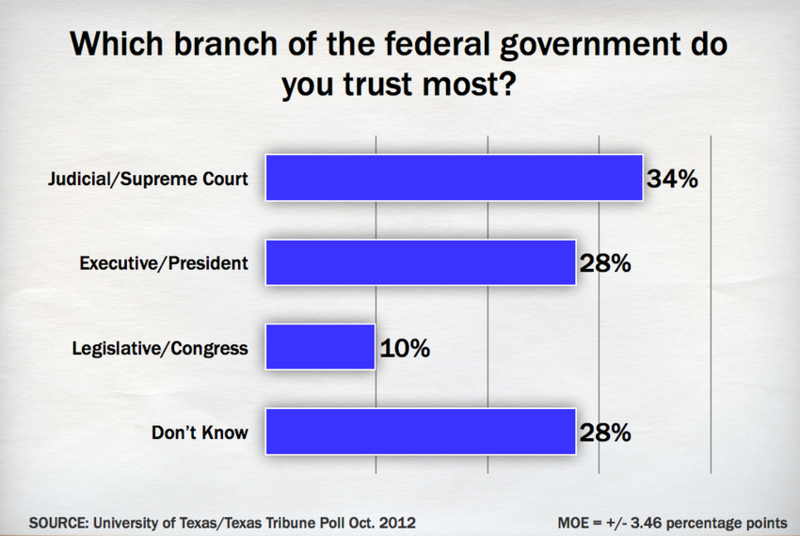 They don’t trust the executive branch because they don’t trust [President] Obama. Congress has just been infected with negative attitudes. Even with the health care case coming out of the Supreme Court in a way that disappointed conservatives, the court is still seen as the backstop for conservative policy. 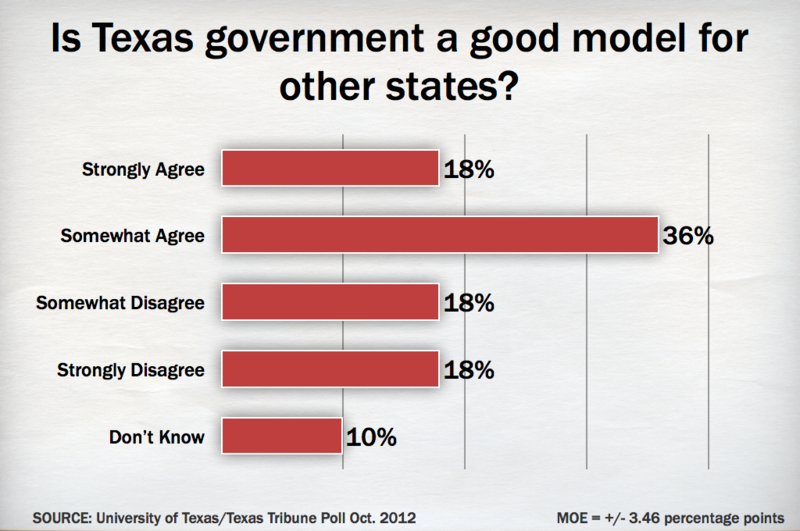 More than half said the Texas government is a good model for other state governments, while 36 percent disagreed with that assessment. That jibes with other findings in the poll, like one that found only 11 percent approve of the job Congress has been doing, and only 40 percent approve of the job Obama has done as president. Texas government doesn’t get sparkling grades from its citizens, but it looks pretty good in comparison with the federal government. “The suspicion of the federal government in Washington has really taken hold here and is not letting go,” Henson said. “The politicians that are campaigning on the argument that state government is a better protector of their quality of life and their interests than the national government — that message is resonating." Almost three in four voters — 72 percent — agree that state government in Austin is “more efficient and less wasteful” than the national government in Washington. 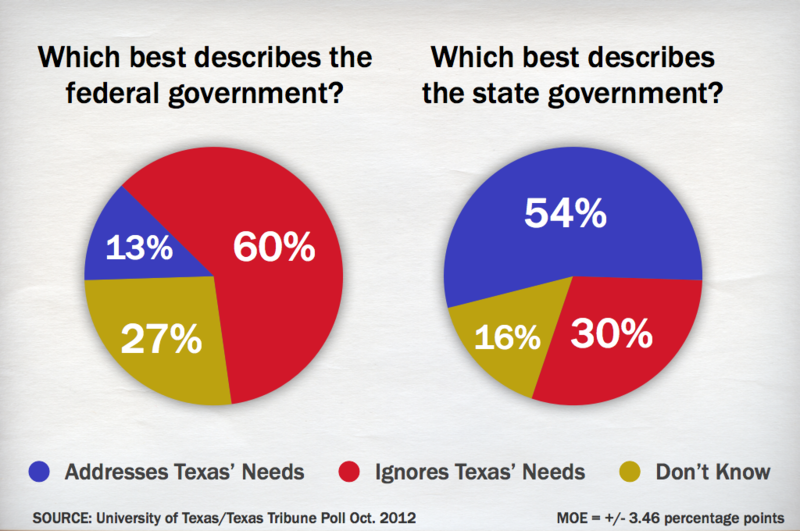 That comparative trend was evident in a question about whether government “mostly addresses” or “mostly ignores” the needs of Texas residents. The state got good marks from 55 percent, while the federal government got good marks from just 13 percent. Is government too divided along partisan lines? 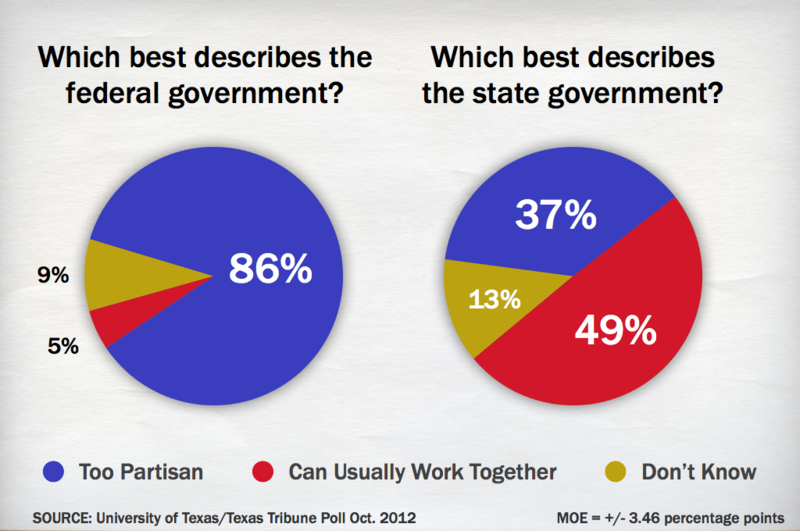 On the state level, 37 percent said so, while 49 percent said people in state government “can usually work together to address issues.” On the federal level, 86 percent said things are too partisan and only 5 percent said government officials can get together and work things out. 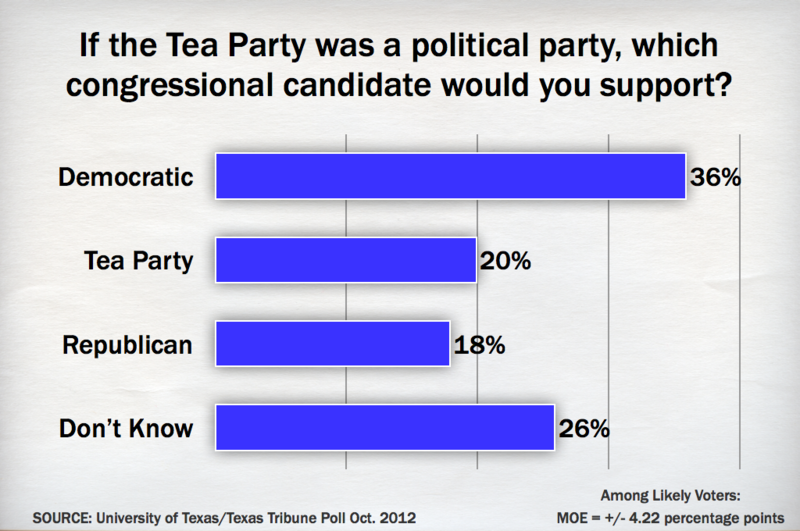 If the Tea Party were an actual political party instead of a movement, 20 percent of likely voters said they would support its congressional candidates, compared with 18 percent who’d vote Republican and 36 percent who’d vote Democratic. 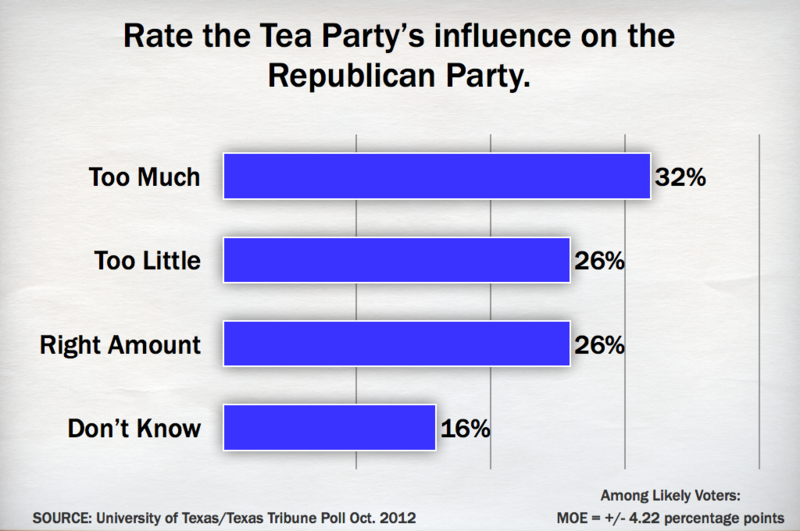 About a third think the Tea Party has too much influence over the GOP, while 26 percent of likely voters said it has too little and another 26 percent said it has about the right amount of influence. When asked what influences their decisions on candidates, most — 56 percent — said they decide based on issues, followed by 20 percent who said character is the most important factor, 14 percent who chose “political record,” 6 percent who chose party and 4 percent who said their choice is based on religious faith. “This is how we see ourselves — it’s a very aspirational view of ourselves,” Shaw said. Most respondents think public employees ought to pay more for their retirement pensions, but the answer varies a bit depending on who is included. The poll split respondents into two groups and asked each a different version of the question (making the margin of error on this question +/- 5.02 percentage points). When asked about the costs of pensions for state and local employees, including police, fire and emergency medical workers, 52 percent said those employees should bear more of their own pension costs. Another group of respondents was asked the same question without the first responders listed; 61 percent said those employees should pay more of the costs of their retirement pensions.